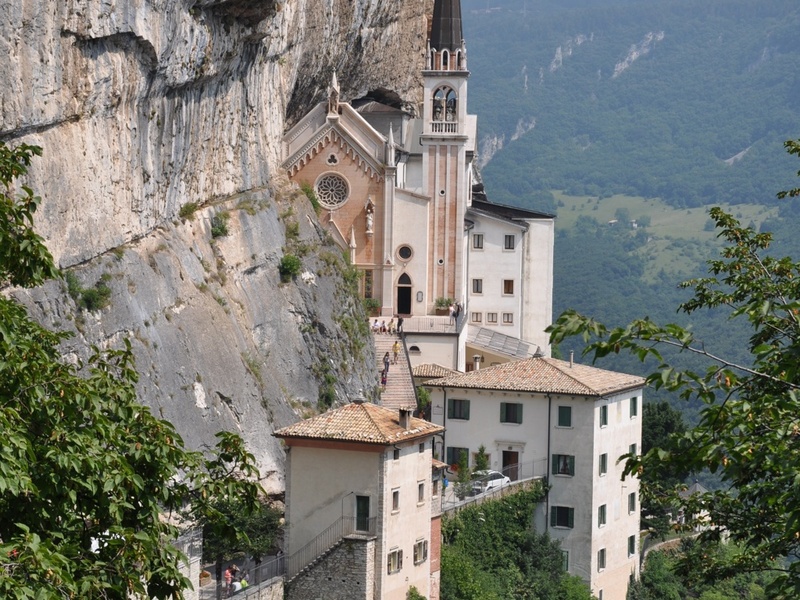 The famous pilgrimage church Madonna della Corona sits at 774 m above the Adige Valley. The church was built at this dizzying height directly into the cliff face. For centuries penitents have climbed the staircase that leads to the church on their knees, asking for forgiveness for their sins. Mass is still held here today, and sometimes in German. Since ancient times, the place has been a mystical spot on the edge of Lake Garda. Traces point to a settlement in pre-Christian times. First, monks who belonged to the San Zeno Monastery of Verona lived in the sanctuary of Madonna della Corona. Then, in the 15th century, the monastery became the property of the Maltese Cross Order. Access is via the provincial road via Costermano and Caprino Veronese to Spiazzi. Here you have to leave the car and take a quarter of an hour's walk. Madonna dell Corona pilgrimage church in Caprino Veronese.